Elementica includes several new and innovative solutions for cost-effective and environmentally friendly data and computing center capacity. The new facility covers 7 main floors. Lower level includes back-up power and heat re-use systems, including air and water circulation. Middle floors will house generators and 5 floors of data center space a part from the electric power station. Top floor will incorporate a grow-house and possibly new office space, with a great view of the surrounding harbor and industrial setting. We aim to grow edibles (“powered by your data”) and serve them in our own café, open to the public. Elementica will house several of Bahnhof’s tried-and-tested safety features, like argon gas containers for pushing out oxygen-filled air if necessary, separated rooms for increased security and several power back-up systems – from giant swing wheels and battery power, to sea water coolant systems and diesel generators as a last resource for increased redundancy. 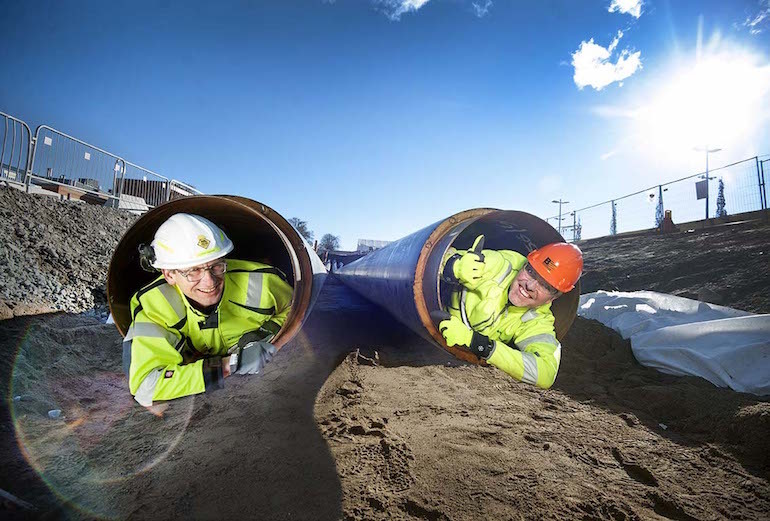 CEO:s from Fortum and Elementica/Bahnhof inspecting the pipes to/from Elementica. Elementica has started the first phase if its construction; laying pipes from/to the near-by city heating plant for heat exchange access. This is an integral part necessary for our heat recovery solution, so we can lower our customers’ electricity bills. Read more on how Elementica integrates into the local city planning here. Elementica, Box 764, 114 79 Stockholm. Visiting address: Tunnelgatan 2, (subway station Hötorget), Stockholm.